We continue to reveal the secrets of SugarCRM customization, and our today article contains a step-by-step guide how to generate user’s activity schedule with the help of a module. To be precise, we will cover the advanced SugarCRM framework, namely, the possibility to create a module for SugarCRM 6, which does not require any storage in a SugarCRM database, but, at the same time, provides the additional upgraded features for CRM system users, i.e. the generation of a user’s activity schedule. It should be noted that the module under discussion can also be applied in the SugarCRM 7 (either through backward-capability mode, or with some customizations of the existing module). What do we need for our SugarCRM customization? So, the issue is to customize SugarCRM system with such a functionality that will generate the working schedule of a company’s employee. To solve it, we need to create a module that does not require any storage in a SugarCRM database, by this, to determine its own module view and to connect the generation of the Excel-file to the PHP Excel library. Declaring a new module, its connection to a CRM system. Defining of a controller, the navigation across the actions, building-up of the controller’s internal logic. Creation of module views with the internal logic. First of all, you need to create a module, and then add it to the list of SugarCRM modules. Let’s name the module, for example, PX_FlexibleSchedule. 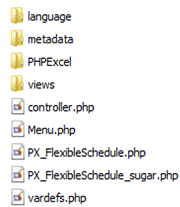 In order to create a standard module, you should create a folder PX_FlexibleSchedule in the “modules” directory. At this step it is necessary to download the PHP Excel library, the language file en_us.lang.php from the language folder and to define PX_FlexibleSchedule_sugar.php file, PX_FlexibleSchedule.php file, Menu.php, vardefs.php file. Here and force, we will not refer to the content of the language file en_us.lang.php, because it is a standard language file, there are no bottlenecks there. Here it should be noted that the field $table_name remains to be empty, because the database table is not created. While declaring the module you need not add anything, particularly, the attribute ‘table’ and the inheritance from VardefManager. What is more, the key moment is that any field, added into $dictionary, should certainly have the parameter ‘source’ => ‘non-db‘. And also you should define the module name in the appropriate language file. As soon as you perform QuickRepair and Rebuild of the system, the just registered module will appear in a CRM system. By this, the system should not request to perform any SQL queries, because at it was mentioned earlier the special module table is not created inside CRM system. The next step is to define the controller.php file. To do it you need to connect the standard controller and to inherit the module controller from it. Here it is important to override the standard actions, so that while switching to them, the customized module views should be replaced, but not the standard ones. Similarly, in such a way the other actions should be overridden with the only difference that the different actions should be replaced by the different views. We’ll define the function ‘$this->excelGenerate()’ a bit further. At this stage, all the added fields should also be placed to vardefs.php file. ‘Panels‘ data array is remained to be empty, as the fields will be added automatically there, depending on the selected days. The view view.confirm_schedule.php and view.generate_schedule.php are inherited from module EditView. You should replace $this-> type with the name of a particular view right within the Module Builder. Also, you should add the fields for validation onto the view.confirm_schedule.php file. And also determine ‘excellGenerate()’ method. The generated Excel-file displaying a user’s activity schedule will be saved on a user PC. To draw the conclusion we want to highlight the obvious pros of such SugarCRM customization . Firstly, from the system perspective, it is not needed to store the generated schedules inside CRM system. 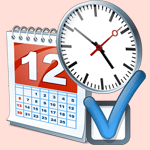 Secondly, from a user’s perspective, it is very convenient to get the ready activity schedule right from his PC. Want to enhance your SugarCRM? If you find the objectives and pros of this article interesting and useful in matters of SugarCRM customization, please, share it on social media.